SAN FRANCISCO & LAS VEGAS--(BUSINESS WIRE)--Oct. 24, 2016-- Visa (NYSE:V) today announced that Visa Checkout is opening its platform to partners – allowing them to integrate the easy and secure payment service into digital wallets for online payments. 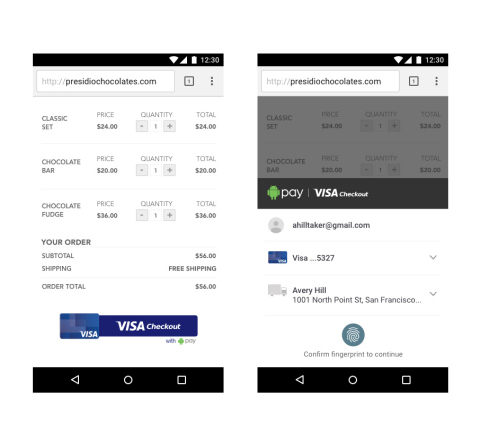 Google's Android Pay will take advantage of this new open platform by offering Visa Checkout to their consumers for online purchases. Issuers, digital wallets and payment app providers will have access to a streamlined set of APIs to easily integrate with the Visa Checkout open platform and immediately begin to offer payments to their customers shopping on their mobile devices. For example, an online shopper who uses Android Pay or another digital wallet that participates – from issuers or other third parties – would simply click the Visa Checkout button on a merchant's checkout page and select their existing authentication method, like fingerprint recognition for Android Pay, to complete a purchase. Issuers and digital wallet providers who utilize the Visa Checkout open platform will be able to extend their payment capabilities to online payments – ensuring their customers can pay everywhere Visa Checkout is accepted, on any device and in apps. Once linked, online banking customers and bank mobile app users will be able to use their banking username and password to access their Visa Checkout accounts. Merchants who integrate with the Visa Checkout open platform will have access to the 3-D Secure 2.0 specification and EMVCo Token Service (VTS) standard. Merchants who have already integrated or plan to integrate Visa Checkout will have access to digital wallets, such as Android Pay - giving them the ability to offer new online and in-app payment services to the potentially millions of consumers who already use digital wallets on the web. In doing so, consumers can choose their favorite way to pay easily and securely online. Visa Checkout's integration with Android Pay offers consumers a consistent, secure and simple payment solution both in-store and online. Similar to shopping and paying in a physical store, consumers using Android Pay will see Visa's acceptance mark – reinforcing the security, easy-of-use and wide acceptance consumers have come to expect from Visa. Visa Checkout was designed specifically for online and mobile shopping and has been shown to increase conversion and sales for merchants. Merchants who integrate Visa Checkout open platform will have access to the 3-D Secure specification and EMVCo Token Service (VTS) standard. VTS is a security technology that replaces cardholder information, such as account numbers and expiration dates, with a unique digital identifier (a "token") that can be used for payment without exposing a cardholder's more sensitive account information. Tokenization hides consumers' confidential account information during digital transactions, making digital payments more secure for everyone, everywhere. "As more connected devices proliferate across the market and become part of our everyday lives, Visa is ensuring secure and easy payments can be embedded in any environment," said Jim McCarthy, executive vice president of innovation and strategic partnerships, Visa Inc. "Similar to walking into a store and paying with a Visa card, Visa Checkout's open platform gives consumers more choice in how they want to pay and merchants and issuers the ability to offer a highly familiar, consistent payment experience that represents security and trust wherever it's used across the web." "With this partnership, Android Pay and Visa Checkout will deliver a frictionless purchase experience at thousands of online merchants that support Visa Checkout," said Pali Bhat, global head of payments products for Google. "We look forward to extending the reach of Android Pay by giving online shoppers even more ways to use Android Pay across the web." "With millions of customers currently using the Capital One mobile apps every day, we are extending our Capital One Wallet to make online shopping and payments easy and secure across the web for our customers," said Tom Poole, Managing VP of Digital at Capital One. "Offering Visa Checkout using Capital One credentials and data security is the right way to extend online payments to our customers." "With Visa Checkout's new open platform, it's never been easier to offer customers a familiar and secure way to pay that seamlessly integrates with their banks' online banking system," said Tom Kunz, senior vice president and director of digital at PNC. "We are continuously innovating to enable our customers to do business how, when, and where they want to," said Dominic Venturo, chief innovation officer at U.S. Bank. "This new open platform will give our consumers a seamless and secure way to make payments across the web and on their mobile devices." "We look forward to working with Visa and its new open platform as a way to offer our customers a streamlined way to pay wherever they want to shop on the web," said Ed Kadletz, executive vice president, head of the deposit products group at Wells Fargo. Issuers, digital wallets and payment app providers can access Visa Checkout open platform in the first half of 2017. One of the fastest-growing consumer products in the company's history, Visa Checkout now has more than 15 million consumer accounts. Hundreds of thousands of merchants and more than 1,400 financial institution partners now offer Visa Checkout in 16 countries around the world; expansion into five additional European countries and India will take place by the end of 2016. Visa Checkout merchants represent some of the world's biggest retailers including Best Buy, Fandango, Gap, Neiman Marcus, Pizza Hut, Staples, Starbucks, Rakuten, Under Armour, Virgin America, Williams-Sonoma and zulily. For a list of participating merchants, and to learn more about Visa Checkout's benefits for merchants, issuers and consumers alike, visit www.visacheckout.com. Visa Inc. (NYSE:V) is a global payments technology company that connects consumers, businesses, financial institutions, and governments in more than 200 countries and territories to fast, secure and reliable electronic payments. We operate one of the world's most advanced processing networks — VisaNet — that is capable of handling more than 65,000 transaction messages a second, with fraud protection for consumers and assured payment for merchants. Visa is not a bank and does not issue cards, extend credit or set rates and fees for consumers. Visa's innovations, however, enable its financial institution customers to offer consumers more choices: pay now with debit, pay ahead of time with prepaid or pay later with credit products. For more information, visit usa.visa.com/aboutvisa, visacorporate.tumblr.com and @VisaNews.